Should I Buy GrubHub Inc. (NYSE: GRUB) Stock? Subject: Should I Buy GrubHub Inc. (NYSE: GRUB) Stock? 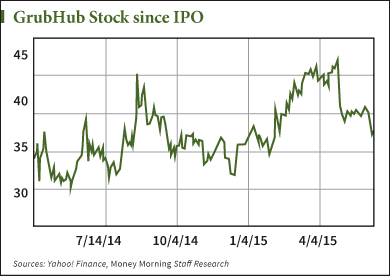 For all the online companies out there, GrubHub Inc. (NYSE: GRUB) stock is certainly one of the better picks. And while the GRUB stock price has certainly been volatile – it was up about 30% this year by late April before it crashed 20% to where it is today (Thursday) at $37.75 – its balance sheet is a lot cleaner than some other players in the space. Groupon Inc. (Nasdaq: GRPN), the online deal-a-day company, for example, strung together nine straight year-over-year quarterly losses up until the fourth quarter last year. That one profitable (just barely) quarter was followed by another loss in the first quarter this year. Then there are companies like the online real estate giant Zillow Group Inc. (Nasdaq: Z), which closed a deal to acquire Trulia Inc. earlier this year. The merger brought together two debt-ridden online listings services that, combined, now shoulder a $186.1 million accumulated deficit. 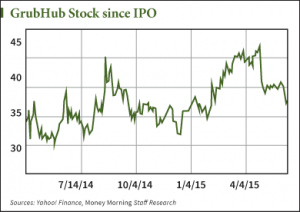 GrubHub isn't wildly profitable – it has a sky-high price-to-earnings ratio of 105.4 – but it has been both growing sales and profits steadily since the much-hyped GrubHub IPO on April 4, 2014. First-quarter GrubHub earnings revealed that the company grew sales 50.6% from the year-ago quarter – from $58.6 million to $88.3 million. GrubHub grew profits 142.8%, from $4.4 million to $10.6 million, and doubled earnings per share from $0.06 to $0.12. None of these numbers are by themselves eye-popping, but they do stand out in a crowd full of duds. But does that mean you should buy GRUB stock? Should I Buy GRUB Stock? It's first important to understand the question, "How does GrubHub make money?" to decide whether its valuation reflects its worth as a company. GrubHub operates a website and mobile app that "connects hungry diners with local takeout restaurants," according to its website. It primarily serves local, independent businesses – 35,000 in 900 U.S. cities and London. They process 235,000 orders on a daily basis and have 5.6 million active users on the platform. And the mobile app for GrubHub is becoming even more important. In the second quarter of 2012, 25% of orders placed came from mobile devices. By the fourth quarter of 2014, that rose to 51%. GrubHub is also looking to tap what could potentially be a very profitable market should they employ an effective growth strategy. According to Euromonitor, U.S. diners spent $221 billion at 365,000 local restaurants in 2013. Of that total, $70 billion were spent on takeout. GrubHub is seemingly only scratching the surface. But then, how does GrubHub make money off this market?